Chocolate bunny 3 individually wrapped double crisp chocolate bunnies. 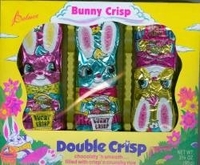 Each bunny is a creamy milk chocolate filled with crisp and crunchy rice and are wrapped in a bright foil. These chocolate bunnies would look just adorable in your Easter basket. These are from Palmer Candy Company and are approx 4.5 inches.